Interview: Academy Award Nominee Jeremy Renner, Star Of 'The Hurt Locker' The actor has been nominated for an Academy Award for his portrayal of a solider disarming explosive devices in the Iraq war thriller The Hurt Locker. Renner describes what it was like to spend hours a day in a Kevlar suit — as well as how it felt to portray a serial killer in the movie Dahmer. A war-on-terror thriller and a sci-fi sensation lead in the nominations, with nine citations each. 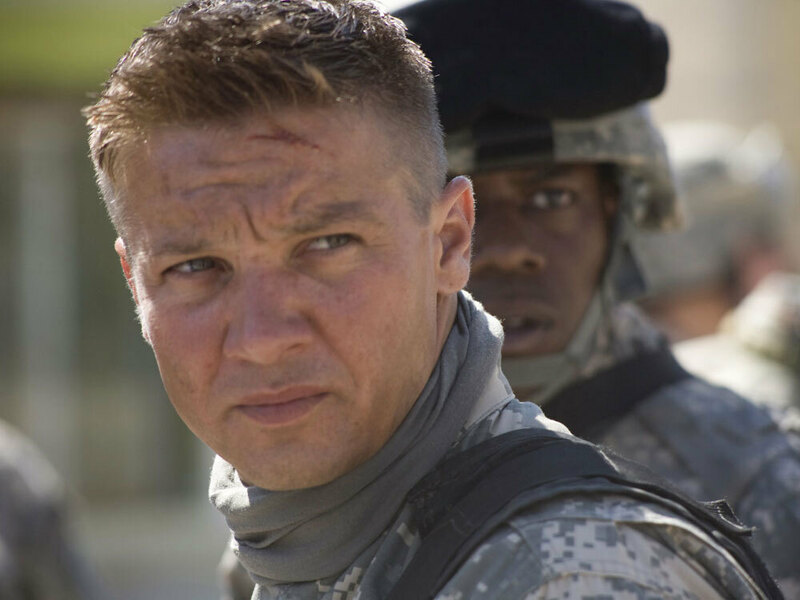 Jeremy Renner as the bomb expert William James in The Hurt Locker, Kathryn Bigelow's Iraq war drama. In The Hurt Locker, Jeremy Renner plays Sgt. 1st Class William James, the leader of an Explosive Ordnance Disposal (EOD) unit responsible for disarming improvised explosive devices (IED) in the Iraqi desert. On the film's set, Renner spent hours a day packed inside a Kevlar bomb suit, while temperatures climbed upward of 100 degrees. For his intense, swaggering portrayal of James, Renner was nominated for an Academy Award. Renner, 39, wasn't widely known in Hollywood before he landed the role. Kathryn Bigelow, the film's director, has said that she chose Renner to play Will James after seeing his performance in the film Dahmer. Renner played the Milwaukee-based serial killer who tortured his victims before dismembering their bodies. Though Renner doesn't physically resemble Dahmer, he gave a chillingly realistic portrayal of a man who could have been played as a cartoon monster. "I couldn't judge him by what he did," Renner tells Terry Gross. "I had to understand, again, what fuels a human being to go to these lengths, to do these things?" In addition to Dahmer and The Hurt Locker, Renner has appeared in The Assassination of Jesse James by the Coward Robert Ford and 28 Weeks Later. "I had to figure out what fueled him. I think I do that with most characters, but especially with Will James because of what he does for a living, and so I had to ask a lot of questions and come up with a lot of answers ... So if I could tap into, 'What fuels this individual?' It separates him from other EOD team leaders, from other individuals ... so I had to do a lot of training in EOD, and that helped." "I had no idea what that would be like ... but there's a certain walk that came out of that. There's a certain mentality and philosophies that came to my mind about how peaceful and almost beautifully poetic that is inside the helmet, and outside it's chaos." "I definitely wouldn't have chosen to have it be a fake suit even if I had that choice, because the suit was such a big part of that character — visually, and then just physically. If it was a fake suit without all the Kevlar in it, I wouldn't have walked the way I walked. I wouldn't have been able to move the way I moved in it. Something sort of very lunar about that suit in the desert ... it ended up working out pretty great." "You have to have a mental toughness. They don't allow you to go any further unless you can do this bomb suit training, because it puts such a mental strain on your spirit. It dumbs you down about 25 to 30 IQ points. You start to hallucinate in the heat inside the suit after 20-30 minutes. So you try not to stay in it too dang long. So the preparation for that — it's either you have it, or you do not." "I had to approach that from a very sort of human thing. I couldn't judge him by what he did. I had to understand again — what fuels a human being to go to these lengths, to do these things. Once I was getting into abandonment issues — once I was getting into abandonment issues and not having his father around, and being a young gay man at 14 who realizes — yeah, so I had to come up with very human behavior for what fuels this individual, and I needed reasons why." "I was really excited. So the actual real cops would say, 'Look, OK. These guys are students and all, but we want you to treat this like real situations. So this is what they know. They got a call. Somebody's unruly, and they have to come and see what the situation is. So be unruly.' ... So, literally this cadet would come in, and as soon as he walks in, I'd push him to the ground and kick him in the balls and spit on him, and he's supposed to try to arrest me. And I got paid $50 a day to do that. It was great."